Mozilla Digital Memory Bank-Go Firefox! 100,000,000 Downloads w00t! 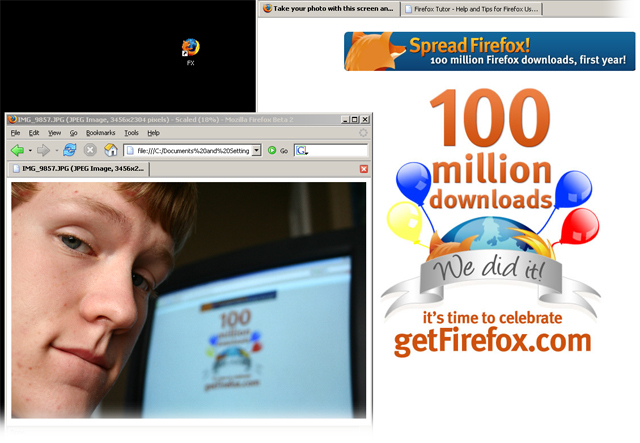 Title: Go Firefox! 100,000,000 Downloads w00t! 100,000,000 Downloads is incredible! Go Mozilla! Go Firefox! Go SFX! And go anyone else who is cool like them! BTW, I'm Ethan from FirefoxTutor.com ...and also Firemonger.org, where I have been designing the UI for Firemonger 1.5(to be released soon after Firefox 1.5 release) which is why FirefoxTutor has had no recent tutorials, sorry!!! Just thought I'd introduce myself, first post and all. Anyways, Firefox/Firemonger 1.5 are gonna be awesome!! !